Kawhi Leonard scores 27 points to lead Toronto over Orlando and advance to Round 2. Kawhi Leonard finishes with 34 points as the Raptors take a commanding 3-1 series lead. D.J. Augustin notches 25 points and six assists as Orlando edges Toronto. Toronto gets the win over Minnesota behind 20 points and six rebounds from Kawhi Leonard. Kemba Walker scores 29 points with eight assists, Jeremy Lamb adds 22 with the game-winning triple as the Hornets edge the Raptors, 113-111. Paskal Siakam and Kawhi Leonard combined for 54 points as the Raptors beat the Nets 115-105. Danny Green scores 29 points as the Magic get the win over the Magic, 121-109. Serge Ibaka finishes with 23 points and 12 rebounds and Fred VanVleet adds 23 of his own as the Raptors take down the Bulls on the road. Overcame a midseason knee injury to average 14.6 points, 7.2 rebounds, 3.6 assists and 1.29 blocks on .473 shooting in 33.7 minutes in 59 games (all starts) in his sixth season in Memphis… Tied his career high for scoring average… Averaged 17.2 points, 7.5 rebounds and 4.4 assists in 36.4 minutes in the first 12 games of the season from Oct. 30‐Nov. 20… Scored 23 points on Nov. 2 at Dallas and again on Nov. 18 at LA Clippers… Recorded at least eight rebounds and eight assists in three consecutive games from Nov. 15‐ 18, joining four other players (LeBron James, Kobe Bryant, Rajon Rondo and Raymond Felton) to accomplish the feat since Gasol joined the NBA… Sustained a left MCL sprain on Nov. 22 vs. San Antonio and missed the next 23 straight contests, during which the Grizzlies went only 10‐13 (.435)… Memphis finished the season 33‐13 (.717) upon his return on Jan. 14, which was the third‐best record in the NBA… Returned to action on Jan. 14 to help guide the Grizzlies to a home victory over Oklahoma City… Made his sixth career three-pointer on a 60‐foot heave from beyond midcourt at the end of the first quarter on March 1 vs. Cleveland… Steadily regained pre‐injury form, increasing his points and rebounding averages each month and averaging 18.0 points and 9.3 rebounds in eight games in April… Recorded a season‐high 24 points on April 4 vs. Denver... Averaged 19.2 points, 11.2 rebounds and 4.2 assists on .571 shooting in 39.0 minutes during Memphis’ five‐game winning streak that closed the season and helped the Grizzlies clinch a franchise‐record fourth consecutive postseason berth and secure the seventh seed in the Western Conference Playoffs… Narrowly missed his first career triple-double with 19 points, nine rebounds and a season‐high tying nine assists in the regular season finale, a 106‐105 overtime home win over Dallas... Led the team or shared the team lead in scoring seven times, rebounding 12 times, assists 11 times, steals 17 times, blocks 30 times and minutes 22 times… Scored 10+ points 48 times and 20+ points eight times… Grabbed 10+ rebounds 10 times… Recorded 10 double‐doubles. 2014 Playoffs: Ranks sixth in minutes per game (43.0)… Scored 10+ points six times and 20+ points once, including a playoff season-high 23 points in Game 4 of the opening round on April 26 vs. Oklahoma City… Grabbed 10+ rebounds twice, including a playoff season-high 15 rebounds in Game 5 of the opening round on April 29 at Oklahoma City… Recorded two double‐doubles (14 career). 2012-13 (Memphis): Named 2012-13 NBA Defensive Player of the Year and displayed all-around versatility in his fifth NBA season, recording 14.1 points, 7.8 rebounds, a career-high 4.0 assists, 1.00 steals and 1.74 blocks on .494 shooting in 35.0 minutes in 80 games (all starts)… Named to the 2012-13 All-NBA Second Team, the highest All-NBA honor ever for a Grizzlies player, and selected to the 2012-13 Second Team All-Defense… Led the team in blocks for the fifth consecutive season and ranked 12th in the NBA in the category… Paced the team in free throw percentage (career-high .848), helping the Grizzlies rank inside the top 10 in the NBA in the category (.773, T-9th)… One of three NBA players (Kevin Durant, Josh Smith) to tally over 600 rebounds, 300 assists and 100 blocks… Scored a season-high 27 points on Jan. 28 at Philadelphia… Grabbed a season-high 15 rebounds on Feb. 1 vs. Washington, March 20 vs. Oklahoma City and April 13 vs. LA Clippers… Tipped in the game-winning basket with 0.8 seconds remaining in an overtime victory on March 20 vs. Oklahoma City, his first career game winner… Posted a career-high 11 assists on March 3 at Orlando, the most by a starting center since Marcus Camby dished out 11 for Denver on April 5, 2008 vs. Sacramento… Tied a franchise record with a career-high eight blocks on Jan. 4 vs. Portland, setting club records with six blocks in the first quarter and seven in the first half… Made 33-straight free throws from Nov. 16-28, the second-longest streak in franchise history behind Anthony Peeler’s 34 consecutive makes from Jan. 19-March 6, 1997… Led the Grizzlies in scoring a team-high tying 20 times… Scored 10-plus points 63 times and 20-plus points 17 times… Memphis went 14-3 when Gasol reached 20 points… Grabbed 10-plus rebounds 20 times… Recorded 18 double-doubles, including 17 point-rebound double-doubles and one point-assist double-double… The Grizzlies went 15-3 when Gasol recorded a double-double… Recorded his 100th career double-double on April 12 at Houston… Remained one of the most durable big men in the league, playing in at least 80 games for the third time in his career… Missed two games from March 23-25 due to an abdominal tear… 2013 Playoffs: Averaged a playoff career-high 17.2 points, 8.8 rebounds, 3.2 assists and a team-high 2.13 blocks on .454 shooting in 40.6 minutes, helping Memphis reach the Western Conference Finals for the first time in franchise history… Ranked T-17th in the league in scoring, T-15th in rebounding and fifth in blocks per game during the postseason… Averaged 14.3 points, 10.0 rebounds, 4.0 assists and 2.00 blocks on .397 shooting in 41.5 minutes in the Western Conference Finals against San Antonio… Averaged 19.3 points, 8.0 rebounds, 2.3 assists and 3.00 blocks on .466 shooting in 42.3 minutes in the Western Conference Semifinals against Oklahoma City… Averaged 17.3 points, 7.5 rebounds, 3.3 assists and 1.67 blocks on .467 shooting in 39.0 minutes in the first round against the Los Angeles Clippers… Blocked a franchise playoff-record six shots in Game 4 of the Western Conference Semifinals on May 13 vs. Oklahoma City. 2008-09 (Memphis): Led the Grizzlies in rebounding (7.4), blocks (1.10), free throws made (275), free throws attempted (375) and double-doubles (17) as a rookie… Averaged 11.9 points on .530 shooting in 30.7 minutes in 82 games (75 starts)… Set a franchise rookie record for field goal percentage and ranked 14th in the NBA in the category… Tallied 15 points and eight rebounds in the T-Mobile Rookie Challenge on Feb. 13, 2009 in Phoenix… Scored a career-high 30 points on March 7, 2009 vs. Philadelphia… Grabbed a career-high tying 16 rebounds on Nov. 3, 2008 vs. Golden State… Posted a career-high 10 assists on March 4, 2009 at LA Clippers… Recorded 27 points and 16 rebounds in the fourth game of his career on Nov. 3, 2008 vs. Golden State, making him the first player since Shaquille O’Neal (Nov. 12, 1992) to post a 25-point, 15-rebound game within the first five games of his NBA career… Notched a double-double (12 points, 12 rebounds) in his NBA debut on Oct. 29, 2008 at Houston. Drafted by the Los Angeles Lakers in the second round (48th overall) of the 2007 NBA Draft on June 28, 2007… Draft rights traded by the Los Angeles Lakers with Kwame Brown, Javaris Crittenton, Aaron McKie, first round draft picks in 2008 and 2010 and cash considerations to the Memphis Grizzlies for Pau Gasol and a 2008 second round draft pick… Signed a multi-year contract with the Memphis Grizzlies on July 9, 2008… Re-signed with the Memphis Grizzlies to a multi-year contract on Dec. 14, 2011. Highly-decorated on the international level as a member of the Spanish National Team, has helped lead his country to seven medals since joining the team in 2006… SUMMER 2013: Won bronze with the Spanish National Team in the 2013 European Championships… Averaged 13.9 points, 7.8 rebounds, 2.2 assists and 1.0 blocks on .511 shooting in 11 games during the competition… Named All-European Championships Best Center and All-European Championships First Team by Eurobasket. com… SUMMER 2012: Took home the silver medal at the 2012 Olympics in London, United Kingdom as a member of the Spanish National Team, posting 12.6 points, 4.8 rebounds and 2.1 assists on .522 shooting in eight games… SUMMER 2011: Won the gold medal at the 2011 FIBA European Championship in Lithuania, averaging 13.3 points, 7.3 rebounds and 2.0 assists on .513 shooting in 11 games… SUMMER 2010: Earned gold at the 2010 FIBA World Championship in Turkey, recording 12.8 points, 6.4 rebounds and 2.33 blocks on .587 shooting in nine games… SUMMER 2009: Helped guide Spain to its first gold medal at the 2009 FIBA European Championship in Poland, averaging 6.7 points, 5.7 rebounds and 1.33 blocks in nine games… SUMMER 2008: Captured the silver medal at the 2008 Olympics in Beijing, China, averaging 7.1 points and 4.6 rebounds on .471 shooting in seven games… SUMMER 2007: Took silver at the 2007 FIBA European Championship in Spain, recording 4.3 points and 2.8 rebounds in nine games… Captured gold at the FIBA World Championship in Japan, averaging 5.5 points and 3.3 rebounds on .773 shooting in eight games… 2006-08 (Spain): Won the 2008 ACB Most Valuable Player Award after posting 16.2 points, 8.3 rebounds and 1.8 blocks on .653 shooting for Akasvayu Girona… A two-time ACB All-Star selection (2007, 2008)… Recorded 13.6 points, 7.0 rebounds and 1.4 blocks in 28.2 minutes in 66 career games over two seasons with Akasvayu Girona… 2003- 06 (Spain): Averaged 3.2 points and 2.7 rebounds in 10.9 minutes in 50 career games over three seasons with F.C. Barcelona. 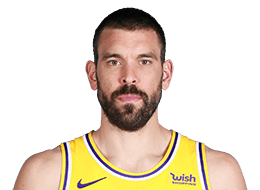 Born Jan. 29, 1985 in Barcelona, Spain… Born Marc Gasol Saez… Son of Marisa and Agusti Gasol… Older brother is Los Angeles Lakers forward Pau Gasol, the Grizzlies’ all-time leading scorer who played seven seasons in Memphis (2001-08)… Draft rights were traded by the Los Angeles Lakers to the Memphis Grizzlies in a blockbuster deal for Pau on Feb. 1, 2008… Younger brother is Adria Gasol, who currently plays for the UCLA Bruins… Mother is a physician and father is a hospital administrator… The Gasol family, including Marc, followed Pau to Memphis when he started his NBA career… Married to wife Cristina… Played two seasons of high school basketball in Memphis for Lausanne (2001-03) before returning to Spain to play professionally for F.C. Barcelona… Lausanne retired his jersey on Dec. 11, 2008… Together with Pau, launched Summer Kids Health Challenge in May 2013… The summer-long competition between Marc’s team of kids and Pau’s team in Los Angeles measured who could live a healthier summer… The captain of the losing team would be forced to shave his beard; Marc’s team won… Hosted the 2012 Staxtacular event, a fundraiser benefit for the Stax Music Academy… Donated $14,000 – $1,000 for each point scored on March 25, 2011 at Chicago – to the Japan Relief and Recovery Fund, helping the people of Japan recover from the devastating earthquake and tsunami of March 2011… The third Spanish-born player to play for the Grizzlies, joining Pau Gasol and fellow Spanish National Team member Juan Carlos Navarro (2007-08).